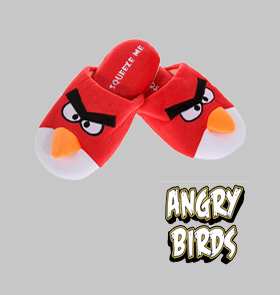 Angry Bird Slippers Only $8 for 35 Hours & Many More Deals!!! Do you have any Angry Birds Addicts at your house??? I know that I sure do! Wouldn't these slippers be perfect for them to be kicked back in, playing Angry Birds? NoMoreRack has got them now, for 35 hours or until they sell out, for only $8! Retail price is $29.99!!! That's a savings of 73%. There are also lots more great items for sale too! This is a daily deal site that I absolutely love!!! Join here and go see what else they have to offer. The deals change from day to day and it is one of the first sites that I check every morning to see if there is something I would like to get. Happy Shopping!!! This slipper is so cute. Perfect for my nephew. He's going crazy about angry birds and all characters in the game.